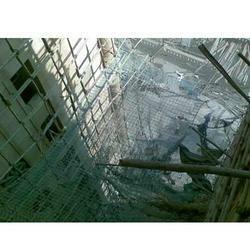 Pioneers in the industry, we offer construction safety net from India. We also deal with Construction Safety Net. Available in Braided Twine Nets, Twisted Twine Nets, Knotless Nets, Knotted Nets. Can be supplied along with containment net for arresting smaller debris. Equipped with high strength border ropes and tie cords for easy & reliable installation. High strength & durability for excellent shock absorption. Heat treated for better knot stability & preventing skewing. Machine made nets for uniform mesh size. Resistant to degradation due to UV rays. PPMF K's safety nets tested and certified as per EN 1263-1:2002 available. Looking for Construction Safety Net ?